Above: St. Georges Anglican Church. 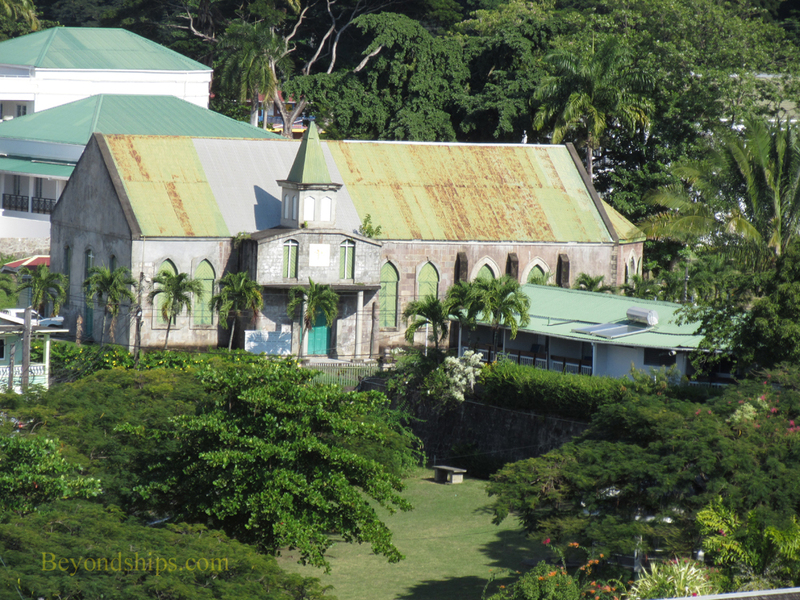 Dominica has several historic churches that have survived fires and/or hurricanes. Dominica's first inhabitants were Ortoroids who arrived from South America in 3100 B.C. They were in turn replaced by the Arawaks and then by the Caribs, who arrived in 1400 A.D.
Less thanr a century after the arrival of the Caribs, Christopher Columbus sailed by the island. He was unable to land but nonetheless named the island Dominica in honor of the fact that he had encountered it on a Sunday. Columbus had been sailing on behalf of Spain. However, in the years that followed, Spain made little progress in colonizing Dominica. This was primarily due to the fierce resistance put up by the Caribs and the rugged terrain of the island. As Spain's power declined in the Caribbean, Great Britain and France became the major powers. In 1660, the two nations agreed not to settle Dominica, leaving it as a refuge for the Caribs. However, this agreement did not last long. By the end of the century, French settlers from nearby Martinique had established communities on Dominica. The British captured Dominica during the Seven Years War. Although France had agreed to cede the island officially to Britain in 1763, the French successfully invaded Dominica during the American Revolution. But in the treaty ending that war, France returned the island to Britain. This did not, however, prevent France from unsuccessfully trying to recapture Dominica in 1795 and then again 1805. The French brought the first African slaves to Dominica around the turn of the 18th century. Under the British, in 1831, free blacks were given the privilege to vote and hold office in Dominica's legislative assembly. As a result, soon after slavery was abolished in 1834, the majority of legislators in Dominica's assembly were black and Dominica became the only British colony to have a black-controlled assembly in the 19th century. However, by the end of the 19th century, the power of the legislative assembly had been eroded and a Crown colony government was instituted. During the 20th century, pressure for the return of representative government grew. In 1967, Dominica became a self-governing member of the West Indies Associated States in free association with Britain in 1967. Independence came in 1978, although Dominica remains a member of the British Commonwealth.